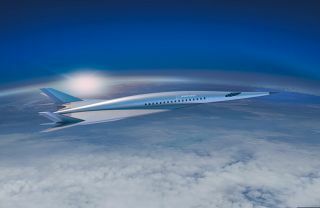 Boeing unveiled a new hypersonic passenger plane concept at the AIAA Aviation Forum 2018 in Atlanta on June 26, 2018. The plane could have military or commercial uses, Boeing says. Boeing has dreams of a hypersonic passenger plane, and it looks like something straight out of science fiction. The hypersonic aircraft could have "military or commercial applications" and is just one of several such vehicles Boeing engineers are studying to develop superfast transportation technology, the company said in a statement. In an artist's concept, the plane looks sleek and futuristic, with extremely swept-back wings, twin tails and sharp, pointed nose.